Provides an additional 7 horsepower and reduces weight up to 14 pounds depending on model. Select model to see weight savings. Give your 600 an additional 7 horsepower and shed 4.5 lbs on 2013-16 models (14 lbs on 2010-12 models). 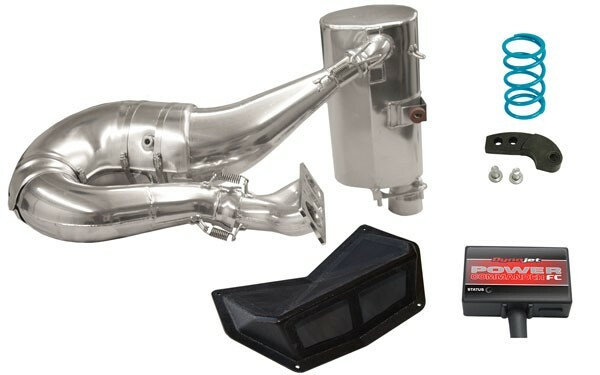 This kit features an SLP Single Pipe Set that includes a pipe, y-pipe and silencer, a High Flow™ Intake Kit for necessary airflow, a PCFC fuel controller with SLP pre-programmed map for proper fueling and an SLP Power Shift™ Clutch Kit to get the horsepower to the ground.